As you know on Xiaomi Mi 6X you will not able to enter to edl mode niether using edl USB Cable nor using the EDL command or options. So the question is how you can enter or boot to edl modebon Xiaomi Mi 6X? and you are at right place to know and understand the complete process to use edl mode on Xiaomi Mi 6X. To use edl mode on this model, you just need to identify the EDL test point on the motherboard of the phone, if you find the correct test point then just connect these 2 points and you are done, and the phone will nowdetected on your computer. Now you can easily flash firmware on your Mi phone and also you can remove mi account of the phone. So dear viewers please study the below mentioned process and use it on your phone to boot to edl mode on Xiaomi Mi 6X. This is also called force edl mode on mi phones. 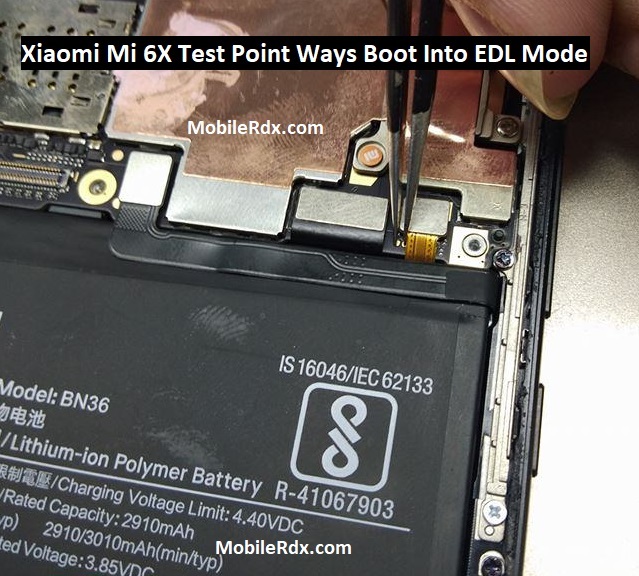 Please see the above image to understand how to edl mode on Xiaomi Mi 6X. As shown in the image short or connect these two points near the on/off and volume key connector. If you have any query related to this topic please do not hesitate to ask through comments. Please go to the comments section below and post a comment for Us and we are Happy to Help You. You can also ask about various Mobile problems by posting a comment.